We’re proud to now offer eCommerce websites for our clients. For several years this has been a goal of ours at New Concept Media, and with the popular WooCommerce plugin and addons for WordPress, eCommerce web design is now a reality. 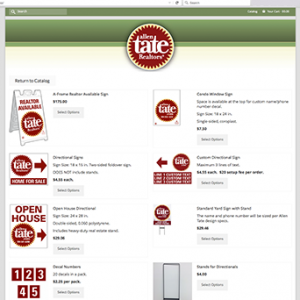 In December 2015 we completed the new atcSignsAdmin.com site, which is an online outlet for Allen Tate realtors throughout North Carolina and South Carolina to purchase signs, including directional, window, open house and other signs and accessories. Our work on the Allen Tate site has given us the experience necessary to offer eCommerce as one of our primary web design services. We’re already maintaining another company’s eCommerce site, and we’ve recently signed a new client that needs this incorporated into their website. If you’re intestered in learning more about what WooCommerce can do for your business, contact Keith Shampine at 704-662-5350 or email keithshampine@gmail.com.